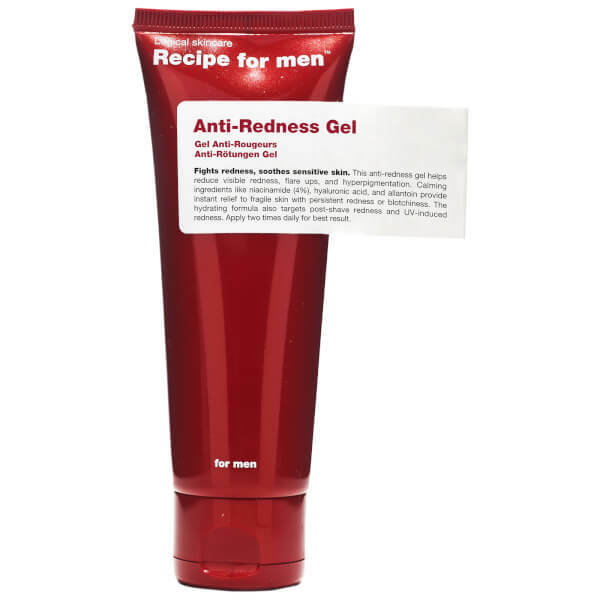 Soothe sensitive skin with Recipe For Men Anti-Redness Gel; a lightweight, fast-absorbing formula infused with calming ingredients to restore long-lasting comfort. Harnessing the powers of Allantoin, Hyaluronic Acid and 4% Niacinamide, the non-greasy gel helps to reduce redness and flare-ups, whilst addressing hyperpigmentation to promote smoother, more refined skin. 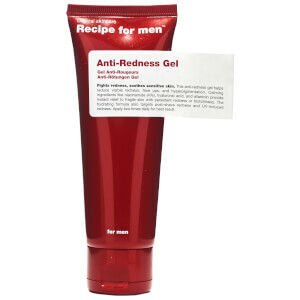 Ideal for post-shave irritation or UV-induced redness. Apply twice daily for best results. If your skin needs extra moisture, follow up with moisturiser. Aqua, Niacinamide, Glycerin, Caprylic/Capric Triglyceride, Propanediol, Caprylyl Methicone, Butylene Glycol, Ammonium Acryloyldimethyltaurate/VP Copolymer, Diethylhexyl Carbonate, Dimethicone, Tocopheryl Acetate, Olus Oil, Dimethicone/Vinyl Dimethicone Crosspolymer, Panthenol, Phenoxyethanol, Allantoin, Parfum, Silica, Benzoic Acid, Glycine Soja Oil, Dehydroacetic Acid, Camelina Sativa Seed Oil, Isoceteth-10, Sodium Hyaluronate, Tocopherol, Beta-Sitosterol, Pantolactone, Squalene, Limonene, Geraniol, Citronellol, Butylphenyl Methylpropional, Hexyl Cinnamal, Cinnamal, Citric Acid, Dextran, Palmitoyl Tripeptide-8, CI 42051, Lactic Acid, Sodium Hydroxide.